Many of you already know the value we place on volunteership at ACM SIGGRAPH. Our organization is governed and driven by our a remarkable/energetic group of volunteers. Without member volunteers we would not—could not—have the dynamic, diverse and knowledgeable organization we have today. 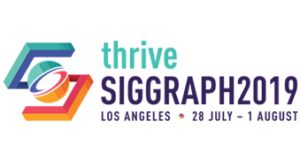 As a SIGGRAPH member and volunteer for 18 years and counting, I really do believe that, collectively, we can make a greater impact, and this translates in our successful programming, workshops and SIGGRAPH conferences. Also, from a personal perspective, I am genuinely grateful for the experience I’ve gained through volunteering—leadership, communications and networking skills—which I think are extremely valuable skill sets to have, and having served in various volunteer roles has allowed me to form relationships and collaborations with many creative, bright professionals in our shared fields. True, volunteering involves a bit of time commitment. For most of us, with busy careers, juggling multiple projects, family and personal lives, our time is limited. But please know—and consider—that we have a wide range of volunteer opportunities with varying levels of time commitment; some roles may require just 2-4 hours a week. For instance, right now, we’re in need of fluent Korean and Japanese speakers who can translate SIGGRAPH conference materials to English, and vice versa. We’re also seeking volunteers for conference documentation as part of our Publications Committee. This role consists of documenting conference programs, such as our Computer Animation Festival at both SIGGRAPH conferences, production sessions and the Art Gallery at SIGGRAPH Asia. For more about these two opportunities, email Diana Arrelano, International Resources Committee and Stephen Spencer, Publications Committee. On the Executive Committee, which would require roughly 5 hours per week, we’ll be searching for three directors, immediately. These directors are voting members of the Executive Committee who help make decisions on behalf of ACM SIGGRAPH. Reach out to Rebecca Strzelec. Please take a moment to look at a comprehensive list of opportunities on our Volunteers Page. There are several volunteer roles with varying degrees of responsibilities. For members who are unsure yet about volunteering or would like to know more about getting involved in general, please don’t hesitate to contact an ACM SIGGRAPH Program Manager who will route your questions to the appropriate EC Member of Standing Chair. This marks my 18th year as a SIGGRAPH member volunteer. The idea of building my network with other like-minded researchers, academics and industry players in computer science is what initially drew me to ACM SIGGRAPH. Getting involved as a volunteer has enriched my experience even more so, opening up another world that, for me, has been truly beneficial. Please consider getting involved–we can really use you!